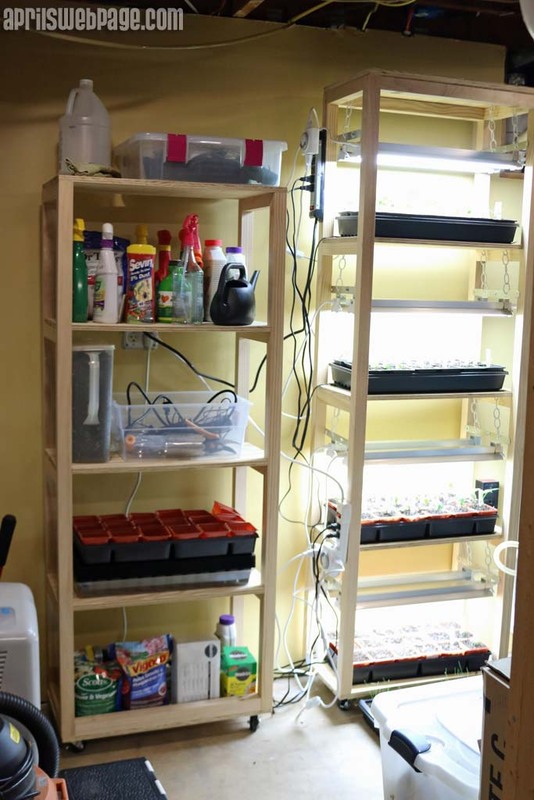 Before I could even write this post up, I had to build another grow light cart to expand. My seedlings got too big, and I had to transfer them to larger cups. 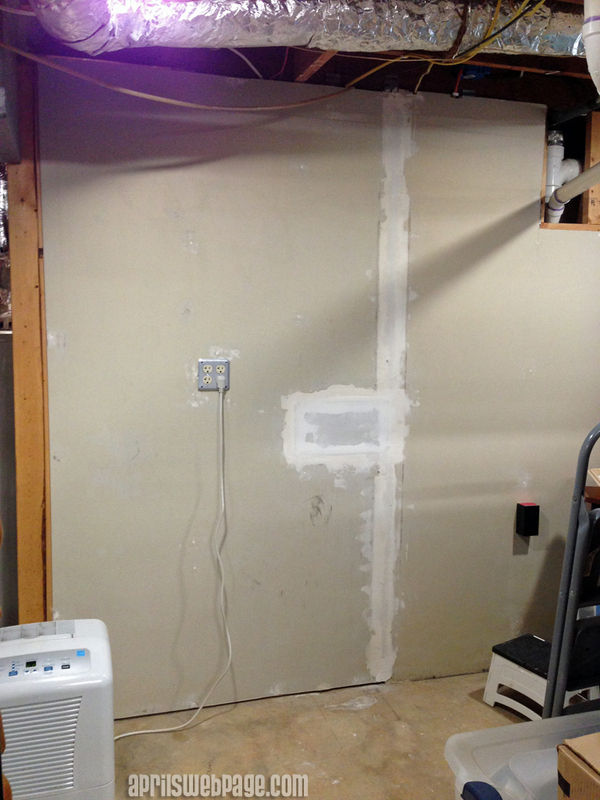 So this post shows the building of the first grow light stand that had 2 shelves for plants and 3 for storage. 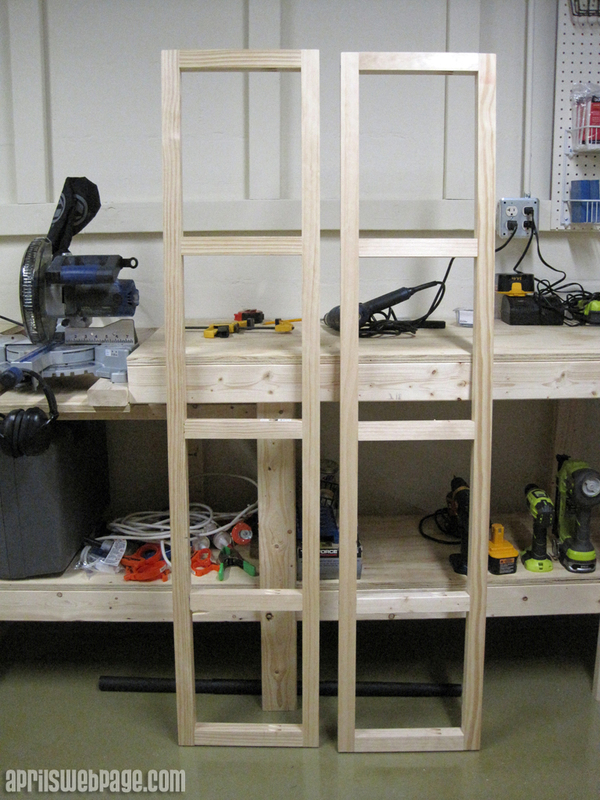 I used 2 x 2 pine for the frame and sanded plywood for the shelves. Since I bought the wrong thickness when doing the tops of my main workbench, I already had more than enough 1/2″ thick plywood on hand. I assemble the two side pieces first. The front pieces are attached with pocket hole screws. 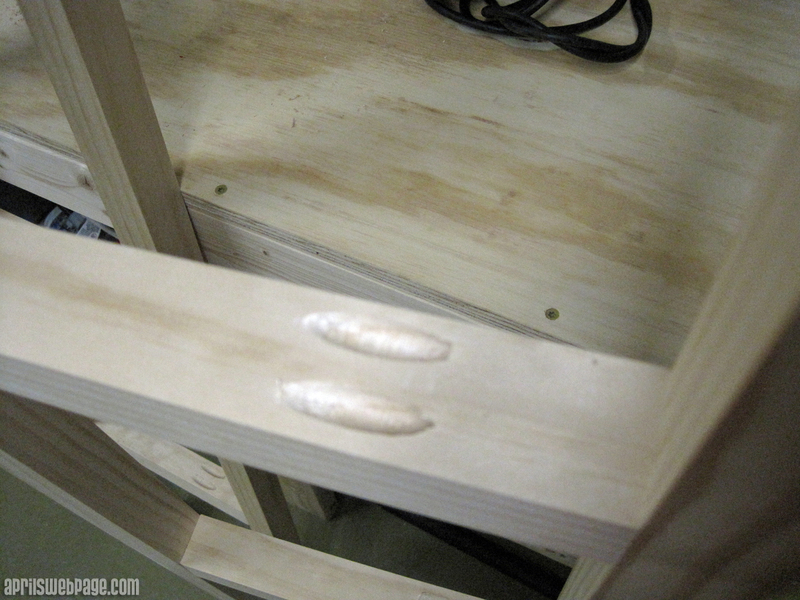 I just drilled normal screws in to attach the long, vertical back pieces since I won’t see that side (and with each short piece being only 10″, my kreg jig driver won’t fit to pocket-hole screw both front and back). 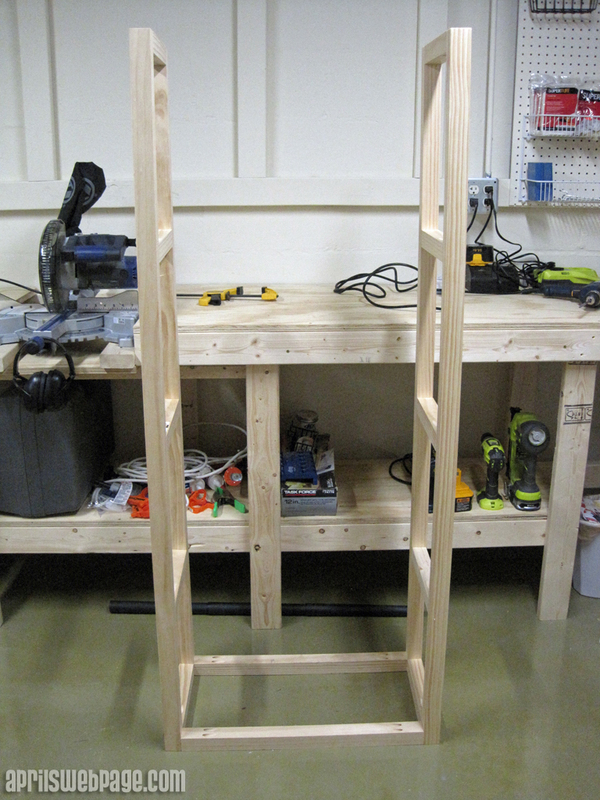 I could have put the pocket holes on the sides of the shelf supports, which would have allowed me to pocket-hole screw both sides, but I wanted the shelves to cover up the pocket holes. And then I attached the 2 pieces together on the bottom. The top is attached via the shelf. 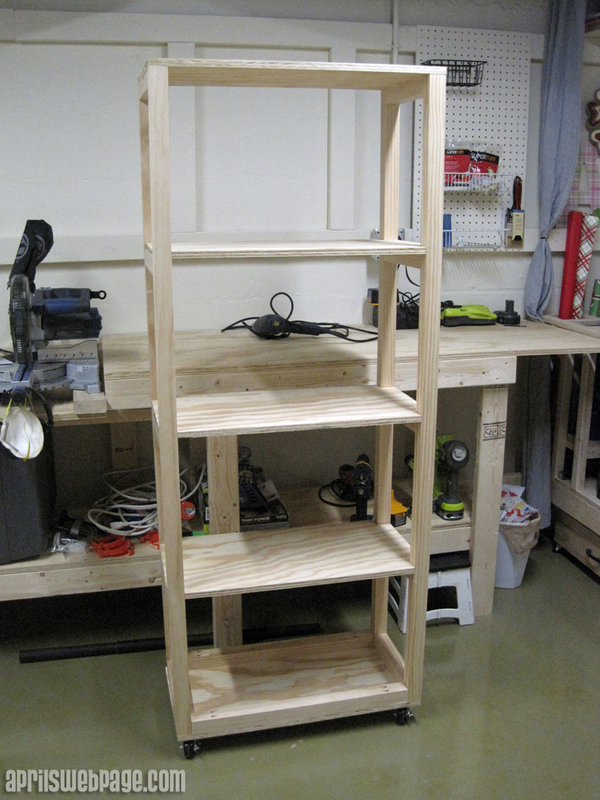 I used 1/2″ plywood for the shelving, and then added casters to the bottom so I could easily move the cart around. 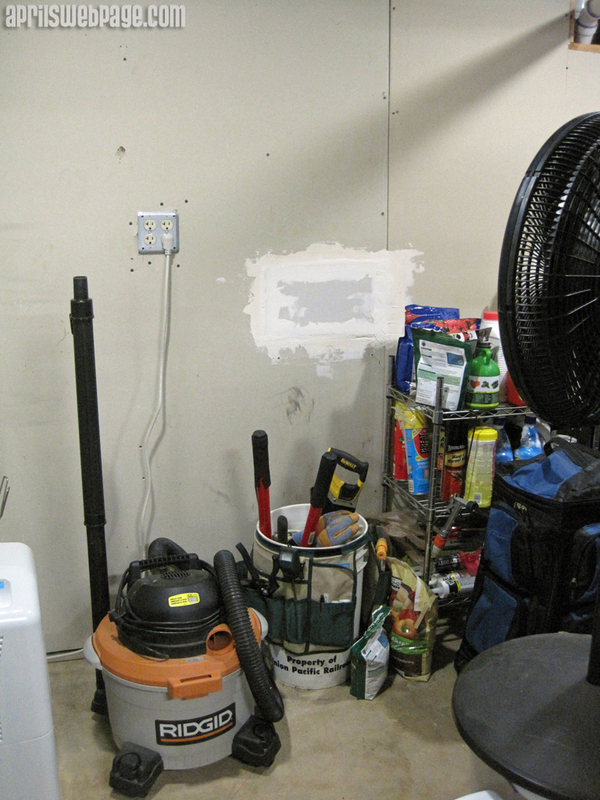 This is the area in our basement where I planned to keep the stand, and it’s not that attractive. I knew I’d be taking lots of pictures of the seedlings as they grew, so I wanted it to look decent. So I patched things up the best I could (I’m definitely no pro with drywall tape or mud), primed the wall, and painted it the same color as our dining room because we had the paint on-hand. Behr’s Warm Muffin, 330D-4. Here are both grow light stands. 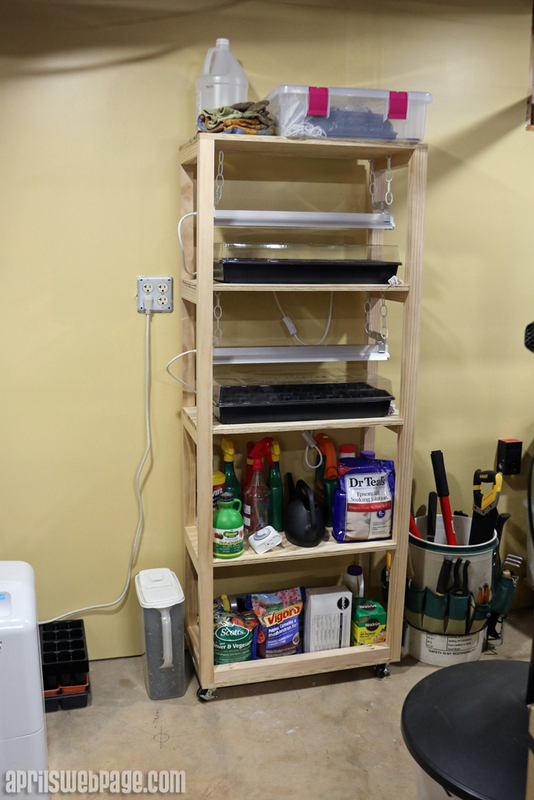 The original is now storage for the gardening stuff, and the taller one gives more room on each shelf for the plants to grow. Unfortunately the new grow-light stand (the taller one) leans a little. I’m not sure why; it’s possible the bottom piece of plywood is a little warped, curving upward a little rather than downward. I originally had the caster wheels further inside the piece of wood so they wouldn’t be visible, so the other day, I took them off and moved them to the outer edge. I had hoped that would fix the imbalance, but it still leans. 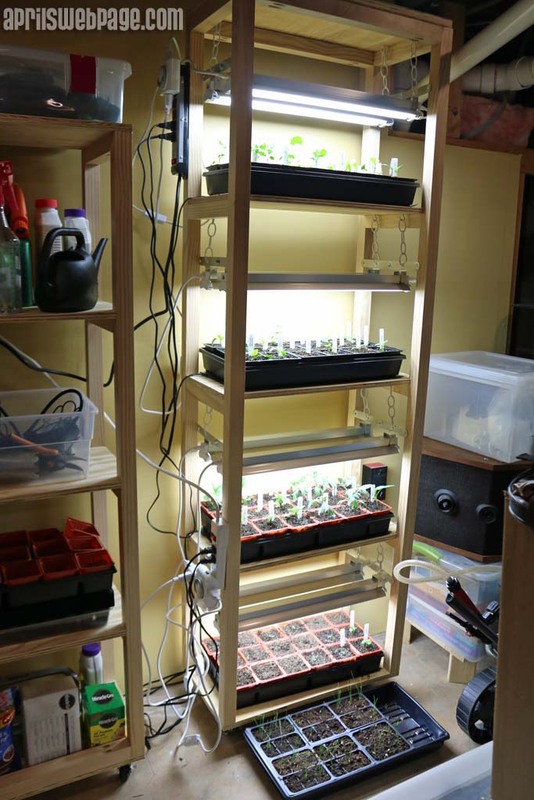 I am about to start new seeds today, so once those are outside or planted in the garden, I might just replace the bottom shelf with a straighter piece of plywood to see if that helps. It drives me crazy that it wobbles a little while tending to the plants.